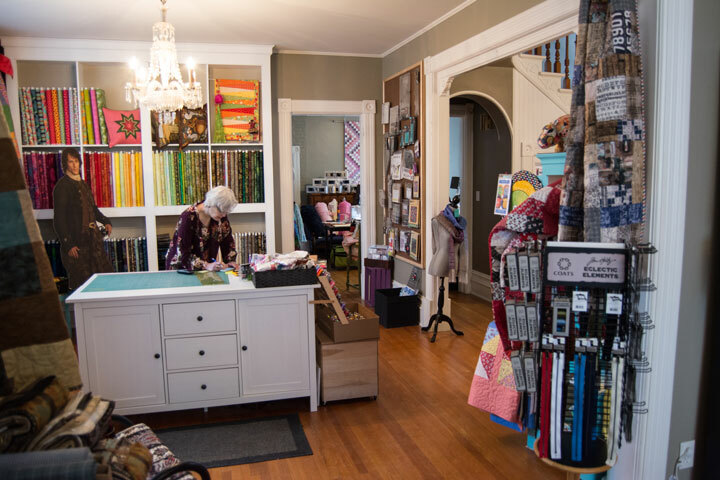 Recently expanded with more great quilting fabric, patterns and accessories, the Pickle Dish quilt shop and studio is your local go-to for all your quilting needs. “When life has got out of hand, I’ve always been able to turn to quilting or sewing to re-centre myself,” says owner Jan Kittle. “I think everybody needs to have a creative outlet.” Kittle says she has been sewing and quilting since she received her first machine at 7 years old. Kittle grew up making her own clothes and eventually took a clothing construction class at Western University. She also made clothes for her three children when they were young – including her daughter’s prom dresses. She said she opened the Pickle Dish because it was a perfect in-the-middle location between other quilt shops in the region. She said she see’s customers from all over Canada and the United States. “I knew I wanted to be in a small community because it gives my customers more than one reason to come through here,” Kittle said, remembering when she first opened her shop about four years ago. The Pickle Dish sells a variety of quilting patterns, fabrics and tools. They also offer quilting classes so that fellow quilters can learn new creative techniques. Kittle and her employees lead the classes. Kittle said she loves to cross-promote other small businesses in Carleton Place by recommending great little cafes, clothing boutiques, shoe stores and more to her customers when they visit her store. “I always say, ‘Not all dress shop customers are quilters, but all my quilters wear clothes!’” Kittle said. “Every small business that opens in town is somebody’s dream.” She said that’s why it’s important to support each other. Each month, the Pickle Dish – and other local quilters – send about 30 mini quilts to the birthing centre at the Almonte Hospital. Each newborn goes home with a quilt. The Pickle Dish participates in the annual Quilting Poker Run. This is an opportunity for quilt shops to share quilt patterns and customers. Quilters travel vast distances from shop-to-shop to collect cards. They then send their hand of cards to the Pickle Dish where Kittle will pick a winning hand. The winner will receive a basket of quilting supplies and materials worth about 6 hundred dollars. “Quilters from Kingston to Montreal come through Carleton Place for this event,” Kittle explains. “I always direct them to other places in town while they’re here. Looking back, Jan Kittle said, she never imagined she would own her own quilt shop. Stop by the Pickle Dish to experience the variety of quilting resources available in Carleton Place! The Pickle DIsh is located at 24 Lake Avenue West in Carleton Place.